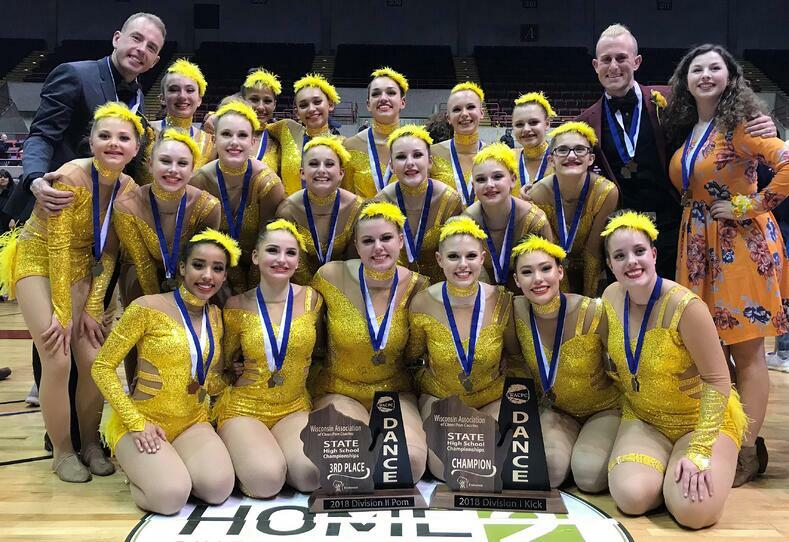 Ashwaubenon Dance Team took WI State by storm this past February! The team took home 3rd place in D2 Pom, and 1st place in D1 Kick. Next up is the DX Americup National Championship taking place March 1-4 in Minneapolis! 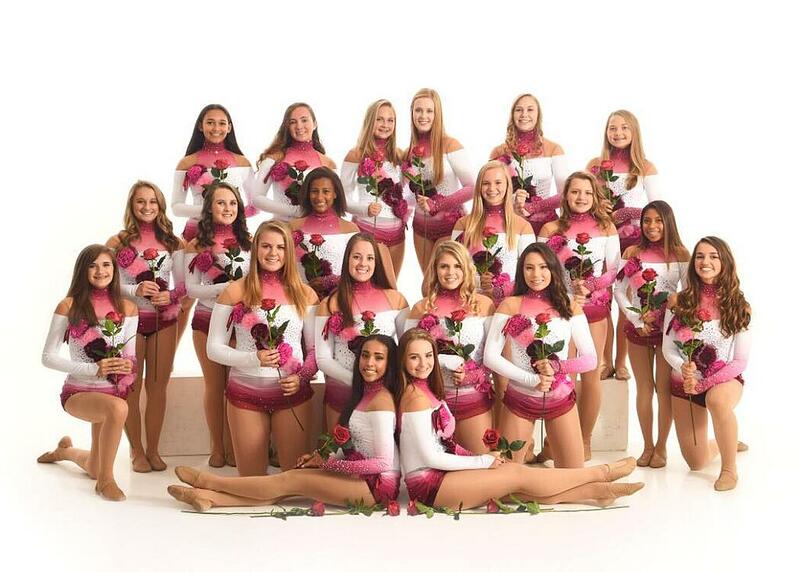 We chatted with coaches Drew Meinel and Rodney Anderson about the inspiration behind their routines and (always) creative custom dance costumes! For their kick routine, the team was inspired by the song "Waking Up in Vegas" by Katy Perry, so they decided on a Vegas Showgirl theme. 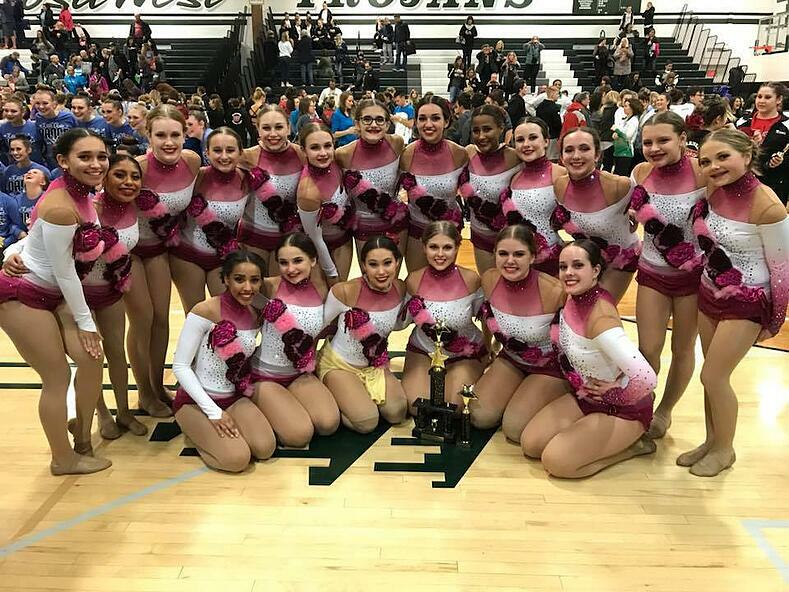 "We wanted it to feel like Vegas Showgirls but in the modern sense, with nods to the big Vegas performers of today like Britney Spears and J.Lo," said Coach Rodney. The custom high kick costume drew inspiration from the ultimate showgirl - Britney Spears - and her VMA performance in 2016. 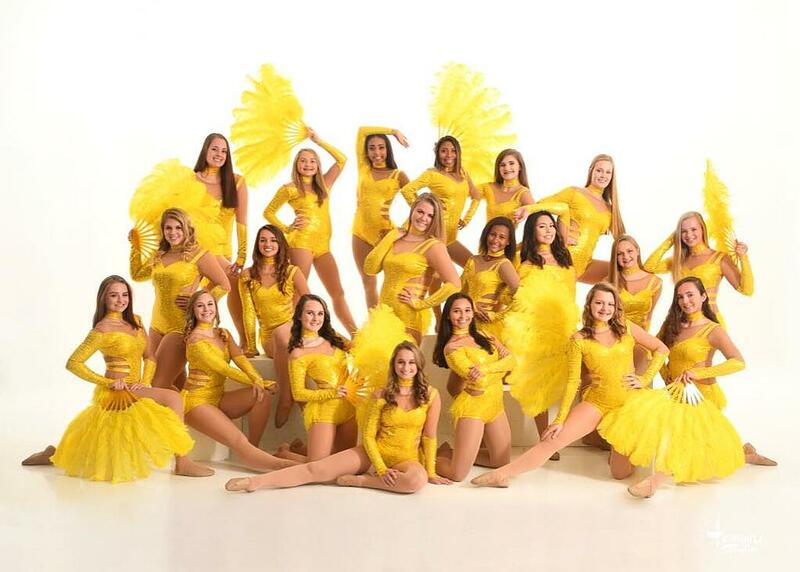 "The bright yellow rhinestoned leotard screamed modern day showgirl to us," said coach Rodney. We don't often see teams using the bold color choice of yellow, but Ashwaubenon had good reason: it was a spin off of their school colors green and gold. "We wanted to play with the gold side of our school colors and only use yellow this year," coach Drew explained. And the final showgirl touch? Feathers, of course! "Since it was a Vegas Showgirl routine we KNEW we wanted ostrich feathers and fringe incorporated into the design, " coach Drew said. 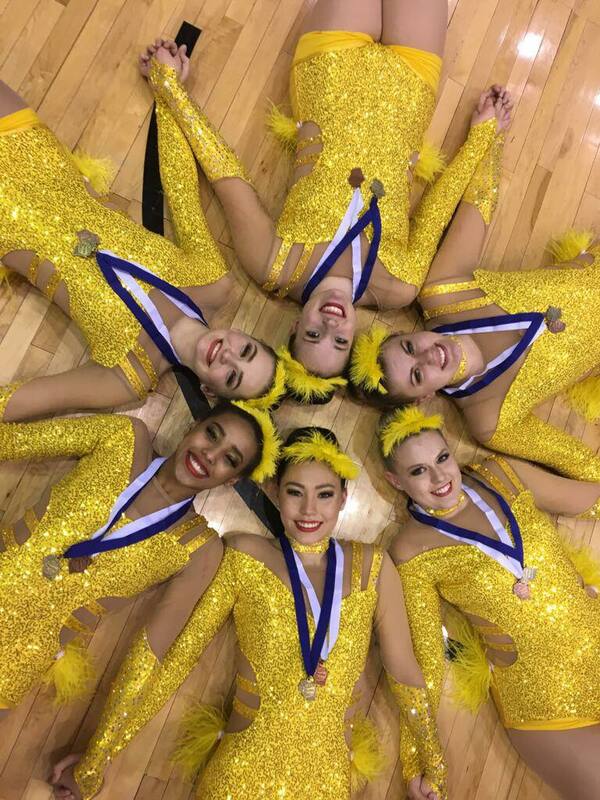 Feathers are something we don't often see in danceline costumes due to competition rules and their delicate nature, but they definitely brought out the showgirl theme in their kick routine! To make cleaning easier, the costume was designed to have detachable feathers. "The finished product turned out great by adding a snap on the skirt so we could still clean the uniform by detaching the feather/fringe skirt," coach Drew said. Check out a video of their performance in these fun showgirl costumes below! The original inspiration (left, Britney Spears at the 2016 VMAs), the team's initial sketch (center), and the final design illustration (right). The song "The Rose," by Better Midler was the source of inspiration for Ashwaubenon's custom jazz costumes. The bold costume colors were drawn from the song lyrics. "We were in love with the contrast of the clean white snow and deep red rose," coach Rodney told us. The white bodice of the costume ombres to deep red and fuchsia, creating the perfect visual to the line "....far beneath the bitter snow." The team added a plush "garden of roses" sash made of fabric faux roses. "We loved the idea of adding the faux floral technique that we have seen The Line Up do on designs before," coach Drew explained. To provide the right balance of texture, dimension, and color coordination, the fabric flowers were sewn in house rather purchasing. Although labor intensive, the final results pull the theme together! 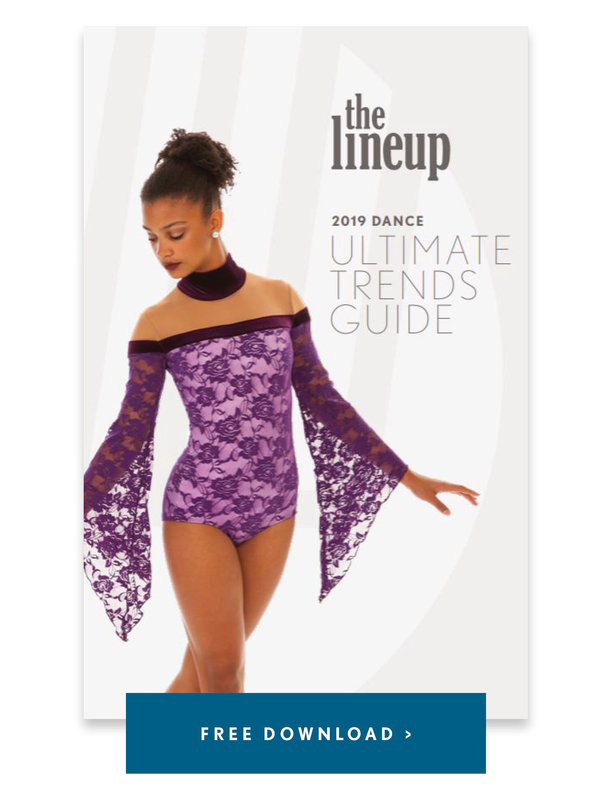 The final look incorporated a long stemmed silk rose prop that they pulled out of the "garden of roses" sash, creating a dazzling visual in the performance. Congrats on a great season, Ashwaubenon! Check out more Q&A with Drew and Rodney, below! 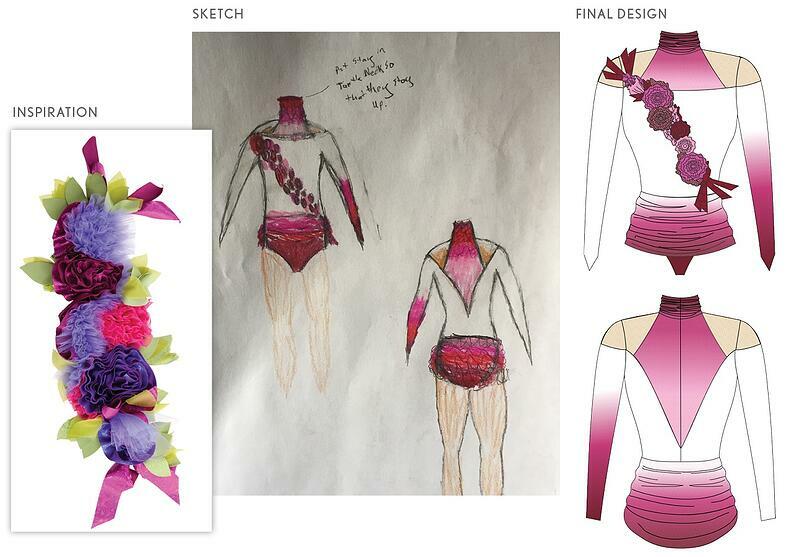 The original inspiration for the floral sash (left), the team's initial sketch (center), and the final design illustration (right). The team removing the silk rose from the "garden of roses" on the bodice of their custom dance costume for their jazz routine. We competed kick to “Vegas Girl” by Connor Maynard, Jazz to “The Rose” by Bette Midler. Rodney: I think what makes our team unique is that we are not afraid to step outside of the norm. 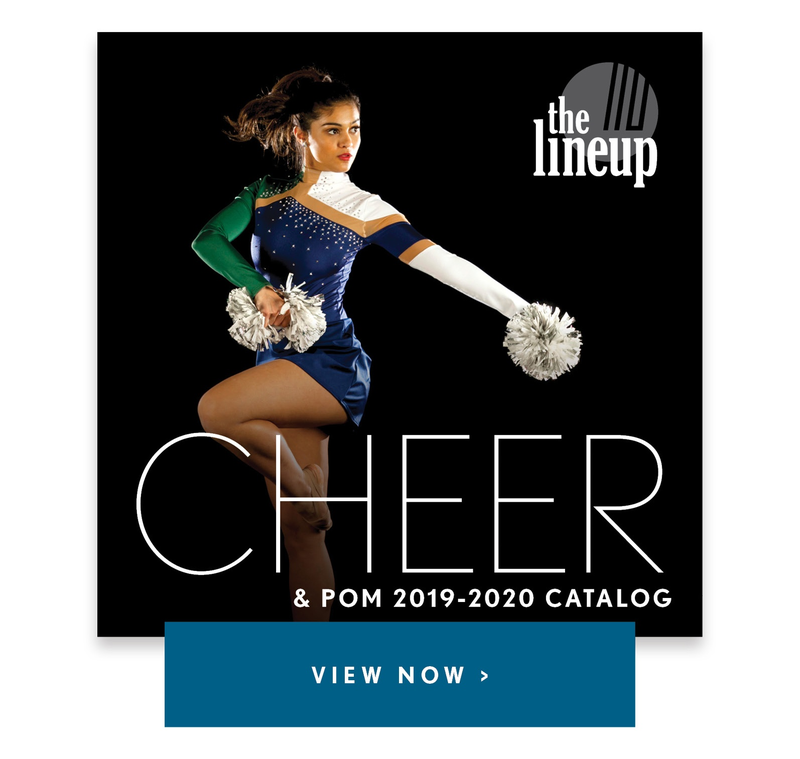 There are so many talented teams out there that we try to use costuming and music to put on a show for two and a half minutes to set us apart. Rodney: Our favorite memory would have to be becoming regional champions in kick. It was a first for our program to win a division at our regional. Drew : This year I think my favorite memory would have been taking the chance to try something new this year. We have always been a Jazz Team. We have taken Jazz and Pom to State every year since we started coaching Ashwaubenon in 2010. This year we decided to try something different. We decided to compete at State with a Kick Routine. This was new territory for us and we definitely had our set backs at the first couple competitions. We had moments of doubt that did we do the right thing? Should we have stayed in Jazz? It was awesome to see our team push through those moments of doubt and continue to work hard towards something we have never put much time and effort in before this year. We ended up winning our Regional Competition to advance to State as well as won our State Competition in Division 1 Kick. It was great to see all their hard work pay off at doing something new and trusting Coach Rodney and my vision. Rodney: Our biggest challenge this season was to keep pushing forward. 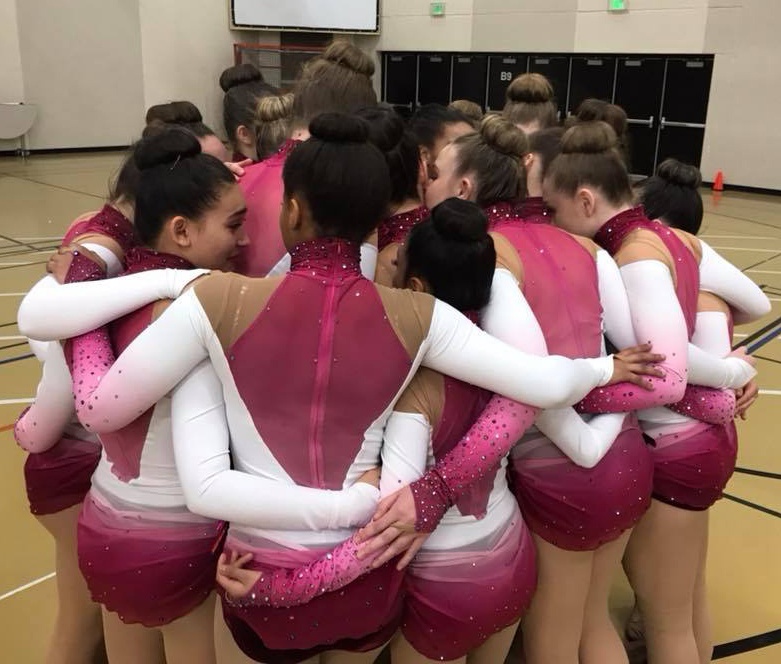 Our first two kick performances were not scoring as high as we had hoped and it took a lot of determination to put our noses to the grindstone and work on our timing and technique so that we could compete at a higher level. It definitely paid off for us in the end. Going on to win our state competition in kick was very rewarding. Drew : Our biggest challenges were overcoming those doubts of not doing as well as we anticipated at our first competitions. Pushing though those barriers and not giving up on our goals!